A native of Corbin, Kentucky, Carl J. McHargue served in the U.S. Army during World War II. Following his discharge in 1946, he entered the University of Kentucky, receiving a Bachelor of Science in metallurgical engineering (with honors) in 1949, and a Master of Science in metallurgical engineering in 1951. He remained at the University of Kentucky to earn the first doctorate awarded by the College of Engineering in 1953. Dr. McHargue joined the staff of the Oak Ridge National Laboratory (ORNL) in 1953 where he held various research and management positions until his retirement in 1990. As manager of materials sciences, he developed one of the largest programs in basic materials research in the United States and made major contributions to the understanding of irradiation effects in solids. His work on textures at ORNL forms the basis of modern practice and he performed pioneering work in phase transformations of rare earth metals, plastic deformation of metals and ceramics, diffusion, and radiation damage. He also initiated the materials development program in support of the Fusion Energy Program, as well as programs to support other advanced energy systems. Dr. McHargue was appointed in 1954 to dual positions with the Oak Ridge National Laboratory and as professor of Materials Science and Engineering at the University of Tennessee-Knoxville. Since his retirement from Oak Ridge, Dr. McHargue continues as professor of Materials Science and Engineering and is Director of the Center for Materials Processing at the University of Tennessee-Knoxville. His research has resulted in over 230 refereed articles in international journals. He holds membership in numerous professional and honor societies including Tau Beta Pi and Sigma Xi. He was inducted as a Fellow of The Metallurgical Society in 1978, which is the society’s highest honor and is limited to 100 living members with no more than five awarded per year. Among other awards are Fellow, ASM International; ORNL Technical Achievement Award; Martin Marietta Technical Achievement Award; American Nuclear Society Contribution to Nuclear Materials Science Award; Department of Energy Materials Science Award; TMS Citation for Contributions to International Activities: and TMS Distinguished Service Award in 2003. 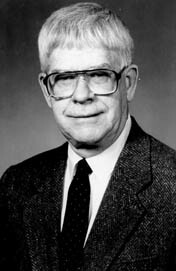 Dr. McHargue was inducted into the College of Engineering Hall of Distinction in 1995. He and his wife, Betty, reside in Knoxville, Tennessee.